Sheet metal fabrication includes a diverse range of processes used to fashion sheet metal into usable products. 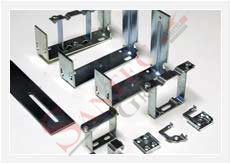 The processes include cutting, bending, rolling, forming, stamping, welding, etc. Products manufactured through sheet metal fabrication are used in a variety of applications right from industrial and commercial to domestic. Sheet metal cutting includes a number of techniques used to cut metal into smaller pieces so that it can be molded or formed into components. Common types of sheet metal cutting involve shearing, electrical discharge machining (EDM), laser cutting, water jet and abrasive cutting. Advantages include almost no material heating during cutting, low side loads and ability to achieve complex shapes. Sheet metal forming processes include those actions, which are used to provide specific shapes to sheet metal. Forming processes are used to shape the sheet metal to its final shape. At the same time, in the rolling process, a series of roll stands is used to shape a strip of flat-rolled metal to a desired cross section. Stamping is the process of impressing surface definition and three-dimensional designs onto materials with pressurized tools and dies. Hardware and fastener creation is the capability to supply and integrate hardware such as handles, latches, fasteners, etc.